Be the first to share your favorite memory, photo or story of Geneva. This memorial page is dedicated for family, friends and future generations to celebrate the life of their loved one. 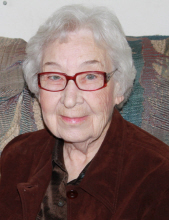 Mrs. Geneva Hodges Breland, 97, of LaGrange and formerly of Savannah, passed away Wednesday, April 3, 2019, at Hospice LaGrange. Mrs. Breland was born March 11, 1922, in Tattnall County, daughter of the late Henry and Sallie Hendrix Hodges. A resident of the Savannah area most of her life, she was a member of Atlantic Primitive Baptist Church, but had attended Dunson United Methodist Church after making her home in LaGrange several years ago. She was recently added to the membership roll of Mt. Carmel United Methodist Church in Grays, SC. Survivors include her son and daughter in-law, Dan and Cherri Breland of LaGrange; grandchildren, David and Meredith Breland, Amanda and Ryan Wardell, Candace and Jarred Baker; and four great-grandchildren, with one more soon to arrive. She was preceded in death by her husband, Joseph Otto Breland, and her brother, L. C. Hodges. The family will receive friends from 6 until 8 Friday, April 5, at Claude A. McKibben and Sons Funeral Home in Hogansville. An additional visitation will be held Saturday night at Fox and Weeks Hodgson Chapel in Savannah and a graveside service will be conducted at 1:00 p.m., Sunday, April 7, at Hillcrest East Cemetery in Savannah. Flowers are welcomed, or memorial contributions may be made to West Georgia Hospice. Claude A. McKibben and Sons Funeral Home is in charge of arrangements. To send flowers or a remembrance gift to the family of Geneva Hodges Breland, please visit our Tribute Store. "Email Address" would like to share the life celebration of Geneva Hodges Breland. Click on the "link" to go to share a favorite memory or leave a condolence message for the family.